Sugar had known a lot of women in his life. But he’d never met anyone quite like this mermaid-haired, tattooed, pierced, smartass woman named Peyton who made it clear she didn’t want anything from him except as many orgasms as he could give her. 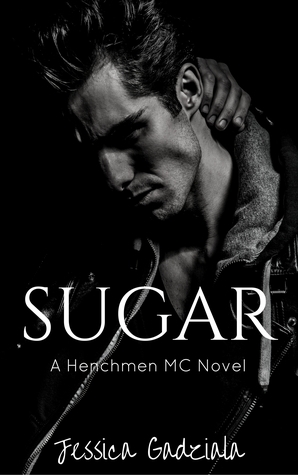 This is Sugar and Peyton’s story and it is the 12th installment in The Henchmen MC Series. These books just keep getting better and better! Peyton is like my double, Unicorn hair – check, Works in library also check! Can drink any man under the table also a big check (Not that I do that regularly anymore) Yes I feel like Peyton could definitely be my double! Sugar really doesn’t know what hit him when she stops on a dark road in the middle of the night to give him a lift. She is this smart mouthed, tattooed, crazy woman who drives a hearse and he can’t help but be very intrigued with her. We got a little look into the Mallick’s & River’s in this book which made me happy and also excited to see what Jessica does with the River Brothers. I also loved that this story focused mainly on Peyton and Sugar. Peyton is a riot all on her own. She was so entertaining to read and I couldn’t put this book down. The Sugar playlist at the end of this book had me in stiches and prepare yourself to get a lot of Baby Bash in your head! As always I’m looking forward to the next book in this series and can’t wait to see who will be next.